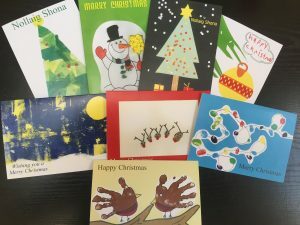 Christmas cards designed by the students are now available from school. €6 per pack or 2 for €10. We have been selling then in Quayside shopping center and have only a few packs left. Please telephone the school if you require any(0719177907). Many thanks to Quayside for facilitating us and to Ryan for all his hard work. Well done Ryan your card is lovely ???? We are all very proud of you love Mom Dad Shane Trudy and Marley xxxxxx!